On the morning of September 5th we went to the visitor center in Jasper and got a permit for that afternoon to drive up to Mount Edith Cavell. (Renovation of the parking lot there prompted the rationing of parking spaces throughout 2017.) After reaching the lot, we hiked to the overlook for the mountain. The photograph above, taken at a mildly wide-angle focal length of 40mm, shows the meltwater lake at the base of one face of the mountain. 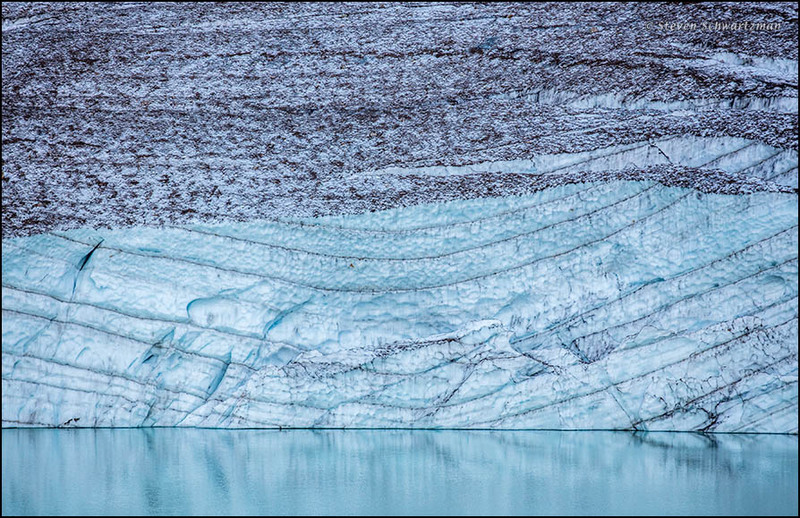 If you click the thumbnail below you’ll suddenly find yourself looking much more closely at a prettily patterned portion of pale blue ice on the lake’s far shore, thanks to the magic of my telephoto lens zoomed to its maximum 400mm. Two weeks after our visit, the road to Mount Edith Cavell closed for the season. 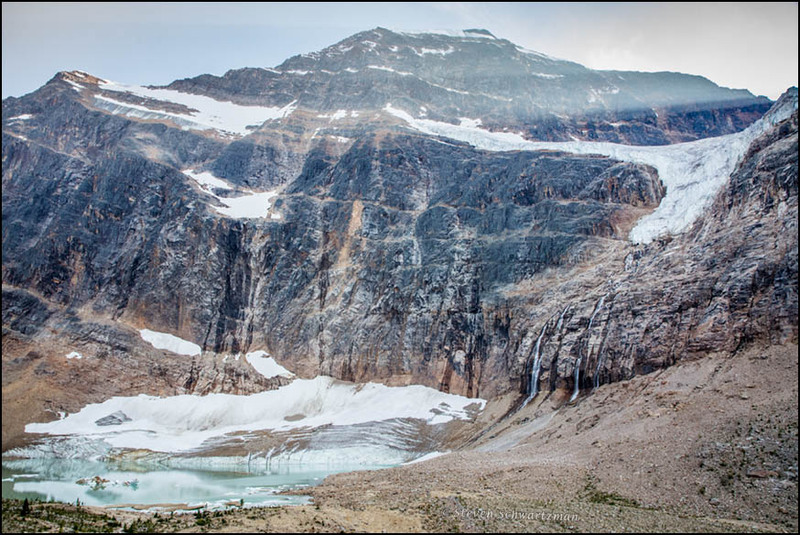 In one of my 2015 posts I wrote ‘the Cavell Nurses’ Trust is organizing a fund-raising ascent of Mount Edith Cavell in Jasper National Park, Canada, 22nd – 29th August 2015′. 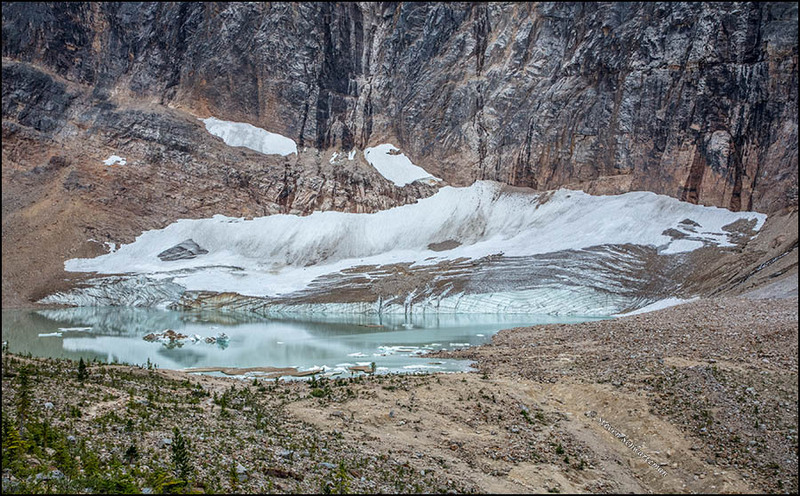 This ascent was a hundred years after the first ascent of Mount Edith Cavell in 1915. Your post prompted me to follow up on the Cavell Nurses’ Trust ascent. https://youtu.be/y3MR1ASsayo I love the magic of your telephoto lens. and remembered it. At the time, the mention of Mount Edith Cavell and Jasper National Park didn’t mean much to me. Little did I know that two years later we’d visit Jasper National Park, the site of today’s post and the three previous ones. At 20 seconds into the video you linked to, there’s a similar view of the meltwater lake, even to the two patches of ice on the wall of the mountain. Apparently the melting pattern was the same in 2015 as in 2017. From the video I learned that the name is pronounced Cávell, rather than the Cavéll I’d been hearing in my head. Oh well, I won’t cavil. This trip was the first real tryout of the 100–400mm lens, which proved both heavy and magical. Would that I could decrease the first quality and increase the second. I always thought it was Cavéll, so perhaps we should cavil with Cávell. I am pleased that through your photos I have seen more of a place I learned about 2 years ago. Isn’t it funny how things can link up? Sometimes there’s a recognizable progression. On our first trip to NZ we didn’t see any glaciers. This February we were happy to visit one, the Franz Josef Glacier. In the Canadian Rockies two months ago we saw a bunch of them. The Cheviot Mine Project is a quite close to the park. Here is some background information for the effect of the project on this World Heritage Site. The blueness of large quantities of sunlit ice is always amazing. I’d seen that kind of blueness in glacial ice on television but never experienced it in person until we visited the Franz Josef Glacier in New Zealand this February. I had no idea we’d see so much more of it just half a year later. As you say, that sunlit blue ice is wonderful to behold. I looked up the Cheviot Mine and finally found a map showing its location. I see it’s northeast—and happily outside of—a boundary of Jasper National Park. (At around 4200 square miles, Jasper is the largest national park in the Canadian Rockies; compare Colorado’s Rocky Mountain National Park at “only” about 415 square miles, or Montana’s Glacier National Park at around 1580 square miles.) I noticed that the Cheviot Mine is in the general vicinity of the town of Hinton, where we spent two nights, and where we noticed some industrial activity in the form of a pulp mill. I also found that coal was mined in Hinton in the 1930s. There seems to be more potential for the Cheviot Mine to interfere with views from the Whitehorse Wildland Provincial Park: https://www.albertaparks.ca/parks/central/whitehorse/. I’ve not been there, so I don’t know what’s visible from where. That looks like a nice place to visit. I like the layering in the ice. I’d never seen curving layers of ice like that. Now you have another reason to return to the Canadian Rockies. During our three weeks we barely touched some of the highlights of the mountains and badlands. There are always good reasons to return to places like that, in my opinion. You get to re-visit favorites and discover new things. Agreed. Just try to go back before or after the worst of the tourist season. Main attractions were mobbed in late August but had begun calming down by the time we left in mid-September. I certainly found that view magical. I’d never seen anything like it. During my grade school years, I went through nearly all the Cherry Ames nursing books during our free reading periods. One day, my teacher handed me a biography of Edith Cavell, and said, “Here. You can handle this.” So I’ve known about Cavell (which I learned to pronounce Cávell) for many decades — although I didn’t know she had a mountain named for her in Canada. I wanted to include a little more at the left edge of the lake, but that would have meant cutting off more of the glacier at the upper right, given that I was already using the widest angle I had available to me, 24mm. In addition to the one zoomed-in view included in the post, I took others, because I was fascinated by the patterns in the ice, as you, not surprisingly, are too. As for stabilization in my long lens, I keep it turned on, which Canon says provides 3–4 stops of extra stability. The old rule-of-thumb for photographers was not to use a shutter speed slower than the reciprocal of the focal length, so with this lens zoomed to its maximum I rarely go slower than 1/400 of a second. We hiked here 10 years ago so gave it a miss this time given the business of getting permits. You can’t miss the mountain though! Visible everywhere in Jasper. I was really happy that we did take the trouble to get a permit. I would hate to have missed this glacial meltwater lake, whose blue ice turned out to be one of the trip’s highlights for me. It’s a special memory from last time – especially as it was on my birthday. Beautiful! Just out of this world…need to visit this place when I go back to Canada. Thanks for sharing!! You’re welcome. I was glad we made the effort to see this place, and now I’m happy to be able to let other people know about it. Good luck getting there.